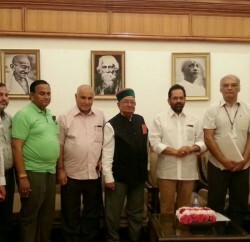 Himachal Pradesh Vidhan Sabha Speaker Brij Bihari Lal Butail presided over district-level Independence Day function at Bilaspur. While speaking at the occasion, Butail said that Bilaspur was leading district of the State in silk production, fisheries and construction of polyhouses. He said that credit for this goes to hardworking people of the district besides innovative welfare policies and programmes of the State Government. Butail said that incidents such as Dhami Goli Kand, Pajhota Andolan, Suket Satyagrah etc. in the State proved to be a turning point in our struggle for freedom. He highlighted the sacrifices made by freedom fighters for attaining the freedom of the country. 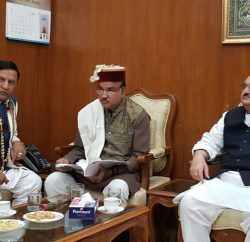 Referring to the health scenario of the State, Butail said that as a result of sustained efforts of the State Government, Indira Gandhi Medical College, Shimla has been included under Pradhan Mantri Swasthya Suraksha Yojna and Rs. 150 crore would be provided under the scheme for the upgradation of IGMC, Shimla. Earlier, Butail paid floral tributes to the martyrs at Shahid Smarak, Changar. Butail also honoured the persons, who had excelled in various fields. 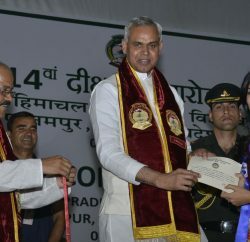 Rajesh Dharamani, Chief Parliamentary Secretary, Ram Lal Thakur, Chairman, State Planning Development and 20-Point Programme Implementation Committee, Bamber Thakur and Randhir Sharma, Rikhi Ram Kaundal, MLAs, Beeru Ram, Tilak Raj, Babu Ram Gautam, former MLAs, Amarnath Dogra, freedom fighter, Rajni Sharma, Chairman, Nagar Parishad, Dr. Ajay Sharma, Deputy Commissioner, senior officers and other prominent persons were present on the occasion.